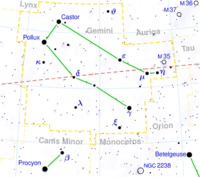 Castor, also known as Alpha Geminorum, is a star system in the constellation of Gemini. Despite the star's alpha Bayer designation, it is the second brightest star of the Gemini constellation, with a total apparent magnitude of +1.58. Originally thought as a single binary star system, the Castor system is actually three sets of tight, spectroscopic binary stars. Based on measurements from the Hipparcos mission, it is estimated that the Castor system is 51.6 light years away. The modern name for the star, Castor, is named for the character of the same name in Greek mythology, who was one of the twin sons of Zeus and Leda. During the era of ancient Greece though, the star was called Ἀπόλλων, (pronounced apóllɔːn), meaning Apollo. In Arabic, the star was called Al Rās al Taum al Muḳaḍḍim, meaning the Head of the Foremost Twin. The first binary pair, Castor A, has a class A dwarf as its primary star (Castor Aa). Astronomers haven't been able to determine decidedly if its secondary star (Castor Ab) is a class M red dwarf or a class A dwarf. Castor B, the second binary pair, is the same. These first two binary pairs orbit each other with an average separation of 104 AU, and take around 445 years to complete. The orbit is quite elliptical with the two pairs get as close as 71 AU, and as far apart as 138 AU, an eccentricity of 0.32. The third binary pair (Castor C) is made up of two, faint class M dwarfs and is separated from the inner quadruple of stars by more than 1,100 AU, with an orbit that may take 10,000 years to complete. These two outer stars are both considered flare stars and thus also designated with the variable star name of YY Geminorum AB. The primary star of the Castor A binary pair, Castor Aa, is a main sequence blue-white star of spectral class A1 V, similar to Sirius. The star is estimated to have a mass 2.15 times that of our Sun, with a radius 2.3 times as great. The bright, blue-white star has a visual luminosity between 17 and 34 times that of our Sun. Both Castor Aa and its companion have a lower metallicity then our own Sun. Castor Aa is separated from its companion Ab by an average distance of only 0.022 AUs, but their orbit is highly eccentric (e=0.499). It takes a total of 9.21 days for the two stars to complete an orbit. Castor Ab is a main sequence dwarf star, however its spectral type is not exactly known. The star may be either a class M red dwarf or a class A blue-white dwarf, similar to Castor Aa. The star is estimated to have a mass that ranges from 40 to 60 percent greater than our own Sun. The star's radius and luminosity is not known. Castor Ab has been repeatedly observed having frequent broadband and x-ray flares, normally associated with red dwarf stars. The combined visual luminosity of Castor Aab is more than 34 times that of the Sun. For an Earth-like world to comfortably maintain liquid water on its surface, the hypothetical planet would have to orbit more than 6.0 AU from the Castor Aab pair, comparable to an orbit distance of Jupiter from our Sun. The primary star of the Castor B binary pair, Castor Ba, is a blue-white, main sequence star of spectral class A2-5 Vm. The star is considered to be similar to Fomalhaut. Castor Ba is estimated to have a mass 1.7 times that of our Sun, and some 1.6 times its diameter. The star has some 14 times the visual luminosity of our Sun. The Castor B pair have a highly circular orbit around each other (e=0.01), with an average distance of 0.03 AUs, allowing them to complete an orbit in only 2.93 days. Like Castor Ab, the second star of the Castor B binary is a main sequence dwarf of an unknown spectral type. The star may be a class M red dwarf or a class A blue-white dwarf, much like its primary companion. The question of the star's spectral type stems from the fact, like Castor Ab, there are frequent x-ray flares from the star. The mass of this star is also estimated to range from 40 to 60 percent more than our Sun, although its visual luminosity and diameter may be less than the Sun. For an Earth-like planet that orbits the Castor Bab pair, the distance the star needs to be for liquid water to comfortably exist on its surface, is around 4.0 AU - about the same distance of the Asteroid Belt from our Sun. Castor Ca, also know by its variable star name YY Geminorum Aa, is a red, main sequence dwarf of spectral type M0.5 Ve. Like the other two binary pairs, it is part of a spectroscopic binary stars. Castor Ca is only 2.6 percent as visually luminous as our own Sun. The Star contains 62 percent of the Sun's mass by comparison and 76 percent of its diameter. Like many class M stars, Castor Ca is a variable flare star that frequently flares, especially in the x-ray range of the spectrum. Castor Ca and Cb are, on average, some 0.018 AUs apart in their circular orbit. This allows the two stars to complete an orbit in only 19.5 hours. From our vantage point on Earth, one star will regularly eclipse the other during their orbit, as the two star's orbit is very near the line of sight. Because of the very close orbit, both stars rotate rapidly from the resultant tidal forces. The companion Castor Cb, also called by its variable star name, YY Geminorum Ab, is a main sequence red dwarf of spectral type M0.5 Ve. The star has 68 percent of the Sun's diameter and 57 percent of its mass. It is estimated to be only 2.6 as visually luminous as the Sun. For an Earth-like world to sustain liquid water on its surface comfortably, the hypothetical planet's orbit would be centered around 0.23 Au from the Castor Cab pair. This would be a closer orbit than that of Mercury around our Sun. At such a close orbit, the world would be tidally locked to the star pair and be highly vulnerable to the occasion massive flares. ↑ From definition of absolute magnitude, using apparent magnitude (+1.58) and distance (51 ly) given here. This page was last modified on 10 May 2018, at 12:26. This page has been accessed 5,747 times.